Get to know the particular maintenance needs of your pool to better preserve its beauty. Wood is a durable material of great beauty that requires specific care, so its original state is preserved. To obtain full satisfaction from your pool, we recommend you perform a few maintenance steps. Aqua-Wood pools are manufactured with high-quality wood that has undergone a protective treatment against biodegradation variables. 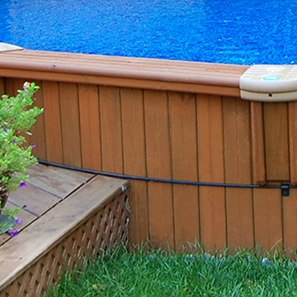 Combined with proper installation and good maintenance, this treatment ensures the durability of your pool. An unprotected wood surface that is exposed to the elements will be prone to graying or colour changes caused by the sun’s UV rays. Moreover, variations in humidity will encourage splitting. It’s a good idea to protect your pool from the elements and harsh weather conditions by the regular application of a semi-transparent stain, which will act as a waterproofing agent, while the pigments it contains will protect against UV damage. When planning your landscape design, be sure to allow 8 inches (20 cm) of free space around the edge of the pool. Do you have additional questions regarding pool maintenance? You’ll find a great deal of useful information on our FAQ page. Don’t hesitate to consult it!